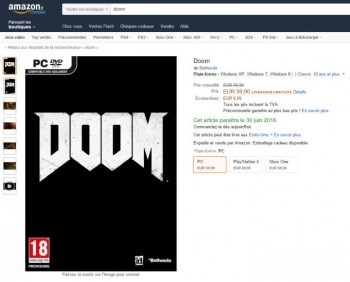 A leak from Amazon France is suggesting Doom will launch on June 30. Bethesda's Doom reboot has been one of its most secretive projects yet, with content and information about the game being fairly slim. However, one of the most important bits of info, the game's release date, may have just been leaked by Amazon France. The site listing for the game on all three platforms says it will launch on June 30, 2016. While far from an official confirmation, it's worth noting that Amazon release date leaks have been accurate in the past. Most recently, it accurately predicted the release date for the PC version of Tomb Raider. That said, it could just be a placeholder date thrown up to attract pre-orders. We have reached out to Bethesda for confirmation.